Andris Nelsons Delivers a Sublime "Der Rosenkavalier"
Perfection confounds the critic. The critical vocabulary is impoverished in the face of such a rarely encountered excellence. How many ways are there to say, ‘It was perfect’? So here I go, shamelessly revealing my limited vocabulary. 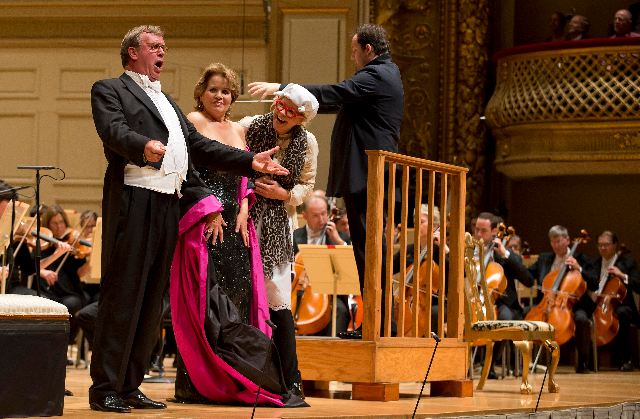 The Boston Symphony Orchestra’s performance of Richard Strauss’s beloved comedy “Der Rosenkavalier” was as close to perfection as I have heard. Not only the two principal female singers, the nonpareil Renee Fleming and Susan Graham, but every member of the large cast down to maids and factotums, was perfect in both sound production and acting. The Boston Symphony Orchestra, playing Strauss’s brilliant waltz-filled score, which seems to throw off rays of silvery light, was perfect. And Andris Nelsons, who over the past two seasons with “Salome” and “Elektra” has revealed himself to be a first-rate Strauss conductor, seemed to reach an even higher level of sympathy with this score, achieving perfection. If there were a fault, it lay with the work itself: At nearly four and a half hours, including two intermissions, it is too long – there can be too much of a good thing. The lengthy passages featuring the boorish Baron Ochs, a country bumpkin despite his title, could be cut. But where? The music, set to words by Hugo von Hofmannsthal that surpassed the highest standard for libretti – that established by Lorenzo da Ponte for Mozart - would resist any editor’s scissors. Better had Hofmannsthal restrained himself from giving every utterance its fullest expression, but then it wouldn’t be the work we love, would it? And the low comedy of those passages featuring the lecherous Baron were at least part of what made the opera such a huge hit in the German-speaking world when it premiered in 1911. The crudeness of behavior and of language – the country dialect is lost on us – was all too familiar to those who first heard it. And for the BSO, German bass Franz Hawlata delivered a fully idiomatic performance that erased memories of Walter Berry who owned the role from the 1950s through the 1970s, at least at the Metropolitan Opera. It was an evening to cherish, to savor, not to criticize, even if long. At its heart were the performances of Fleming and Graham who have sung the two roles together many times, but reportedly will not after these BSO performances. So the bittersweet quality of the music and text took on an extra layer: We were witnessing something that was great, which will not be repeated. The genius of Hofmannsthal’s text and Strauss’s response to it – it was as if one person were responsible for both – is that it seems to create a conversation so natural as to belong to the “real” world, not a representation of it. And it was a delight to watch and listen to these two women have that conversation they have had so many times before, every nuance of text and score realized to perfection – that word again – but also freshly, as if for the first time. In the old Viennese tradition, which, by the way, Hofmannsthal made up, a courtier delivers a silver rose to the intended ahead of the arrival of the suitor. Ochs asks his city cousin to recommend someone appropriate. She suggests Octavian, who has donned a maid’s costume so Ochs will not suspect their dalliance. (Hence, Octavian is Der Rosenkavalier, the Knight of the Rose, the opera’s titular character.) Of course, the two young people fall in love, Ochs repulses both Sophie and her father, and there is a silly plot in a country inn to discredit him. At the end, the Marschallin enters, after having been absent from much of the work, Ochs accepts his defeat, and she and the two young lovers sing a sublime trio, she leaves, and the two kids sing a sweet duet. In that first scene, the lovers indulge in post-coital talk, their chit-chat caressed by woodwinds and strings. Fleming’s voice is a marvel, rich, silvered, pouring out plush sound that explodes in golden high notes. Graham’s lower voice starts deep within her and rises to overflow like honey. They sit together on a divan, petting and cooing, Fleming in a black gown with a black, fuschia-lined shawl, Graham in boy drag – a fringed ivory top and black trousers and boots. Above them on the podium, Nelsons followed their lead, as conductors of opera are wise to do, bringing the orchestra together with them into an organic whole. They are interrupted by Ochs, and then the Marschallin’s boudoir, a semi-public space in 18th century fashion, is invaded by her morning reception of supplicants and tradespeople looking for favors. When they all clear out, she holds the silver rose, rubbing it against her cheek, which brings back memories of her own youth and her betrothal to what turned out to be a neglectful husband. She reflects on aging – she is only 32 - and time passing, “the fragility of all things.” When Octavian returns, she turns on him. “Someday you will leave me for someone younger and prettier,” she sings, he protesting, confused by her mood. She sends him on his way, promising that they will be able to meet later that afternoon as she rides in her carriage through the Prater, the vast park on the outskirts of Vienna. This last scene is profoundly melancholy – indeed, the entire work, even though it ends in a “wedding,” and is thus by definition a comedy, is steeped in melancholy, sadness and yearning. These are the Marschallin’s emotions, so even though she spends relatively little time on the stage, she is the opera’s central character. We care about her the most. Fleming has long excelled at this role, capturing its melancholy and communicating it to the audience better than any of her peers. Indeed, during the 13 years I attended the San Francisco Opera, her interpretation of the Marschallin, some 15 years ago, brought forth the only legitimate standing ovation I witnessed in that phlegmatic house. (Incidentally, both Graham and Hawlata co-starred.) At that time, Fleming had many years to go in her career, although she put “Der Rosenkavalier” on the back burner for a while, for too long, I would say, singing in too many mediocre contemporary operas and turning out an embarrassing album of light “rock” songs. In any case, she is singing the Marschallin again - thank the gods - while she still has the voice. And, boy, does she. Indeed, as she hands off the rose, she exquisitely floated a high note that caused chills. But although she will be singing it again on stage at the Met in the spring, she will be inevitably cutting back on stage performances of her signature role. She brings the melancholy of her own situation to the melancholy of her character, creating an expression as profound as one experiences in the opera house. It was a privilege to hear her. After what seems like hours of low comedy, the Marschallin returns at the end of the third act. Fleming had a costume change during her break and she reappeared wearing a low-cut black gown shot with silver and long black gloves. It was the epitome of chic – I wish I knew more about fashion so I could name the designer. Fleming is a glamorous woman, a true diva in a world full of discount versions, and she plays it up - and why shouldn’t she? The trio that follows her entrance is often called the most beautiful vocal writing for female voices ever composed. And it is. It is swoon-worthy. Three voices, two high, one lower, each a different coloration, soar together, interweaving, in rarefied communication. I cried. I always cry. Many people do. The orchestra stops for a moment and then swelling strings announce the Marschallin’s arrival. Suddenly we are no longer in a rustic inn where a farce is being played out – we are on a higher plain of feeling and thought. This is what opera is all about. Through all of this Graham has been the, uh, man for all seasons – a spirited youth in love with love and in love with his older lover, the game youngster who puts on a serving girl’s dowdy uniform to fool the doddering Ochs, the gallant young lover whose chest heaves with love for his new love. Throughout her voice was strong, eloquent, beautiful in its depths and heights, with no audible break. Her comic acting and nasal singing as Mariandel – in which she is a woman playing a boy playing a girl – is hilarious. It was no surprise that she received the loudest ovation of the evening. She was the Rosenkavalier. Sophie is sort of a thankless role. A naïve girl straight from the proverbial convert, she shows her mettle by refusing the crude advances of Ochs, but she is lost for the most part in the proceedings. All she is asked to do is to sing sweetly with Octavian in the second act presentation of the rose scene and in the final trio and duet. Erin Morley, the Sophie of choice in the big houses today, did what was required but she didn’t stand out. But look at who she was singing with. As noted before, Hawlata as Ochs redefined the role. Pathetic, narcissistic, sexist – if he had an opportunity to express any sort of racism he would remind you of a certain Presidential candidate. He was also hilarious – his repeated pelvis thrusts brought forth laughter even if the audience didn’t follow his Austrian dialect - and his scenes with Graham as Mariandel were choice. The rest of the enormous cast was excellent. First, two big-voiced women who sing mostly in Europe. As Marianne, Sophie’s duenna, German soprano Irmgard Vilsmaier would have woken you up if you had dozed off, but every note was perfectly placed. And as Anninna, the Italian adventurous who leads the chorus of children screaming “Papa, papa” at Ochs in the tavern scene – don’t ask – mezzo-soprano Jane Henschel was in stentorian form, although she didn’t equal her achievements as Herodias in “Salome” and Klytamestra in “Elektra” in the BSO’s previous forays into Strauss. But that wasn’t her fault - it was that the comic role didn’t give her the opportunity to raise the hair on the back of your neck. As Anninna’s partner in crime, Valzacchi, who sang with an Italian-accented German – it was in the supertitles – tenor Graham Clark could not have been surpassed. As the “Italian tenor,” a singer who presents a lovely Italian aria to the Marschallin during her morning reception – the aria is Strauss’s affectionate satire of a rival tradition - Stephen Costello did his fulsome best. And as Faninal, Sophie’s upwardly mobile father, baritone Alan Opie did the most he could do with a supporting character. The many smaller roles were all admirably dispatched. Shout-outs to several Boston-based singers – tenor Neal Ferreira as an animal vendor, baritone David Kravitz as a notary and bass David Cushing as a police commissary. This is the third Strauss opera with which Nelsons has chosen to open the subscription season. I’m sure I’m not the only audience member who is wondering, what’s next? So far he’s gone in order of composition, skipping two early works. 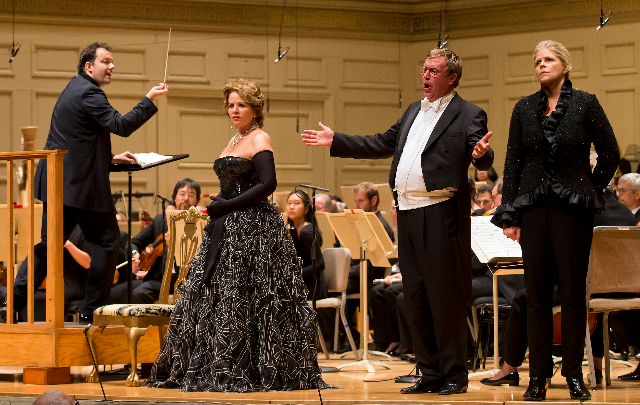 Chronologically, the next would be “Ariadne auf Naxos,” which would be a treat, but that’s a work that has been done here by other forces, namely the Boston Lyric Opera. What about “Die Frau ohne Schatten,” an exotic and to our sensibilities, distasteful work – it is about women’s imperative to bear children - that is hardly ever done? Or, skipping way ahead, what about “Capriccio,” another problematic work – it was premiered during World War II in Munich in an opera house where all its Jewish employees had long since been fired and sent to the camps if they had not been lucky enough to escape? But in my experience, “Capriccio,” an opera about the nature of opera, is artistically one of the greatest works of the 20th century. Or maybe he could escape the Strauss pattern and go to, for instance, Puccini. We’d love to hear “La fanciulla del’West,” another rarity that requires symphonic forces. 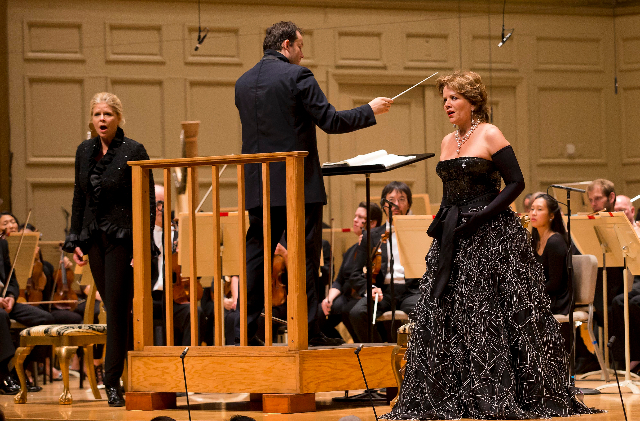 Or one of Janacek’s great, seldom done in Boston, operas? How about Messaien’s “St. Francis of Assisi”? Or maybe Ligeti’s “Le Grande Macabre”? We’ll leave it to the Maestro. So far his choices have not disappointed us.